UPDATE – 22 May 3:30 p.m.: GRU’s press office contacted WUFT News with more information regarding the handling of the certified letter sent by Seniors vs. Crime. Although Sterling did not respond to the letter, she did forward the issue to GRU’s attorney Shayla McNeill. McNeill has not been made available for comment. 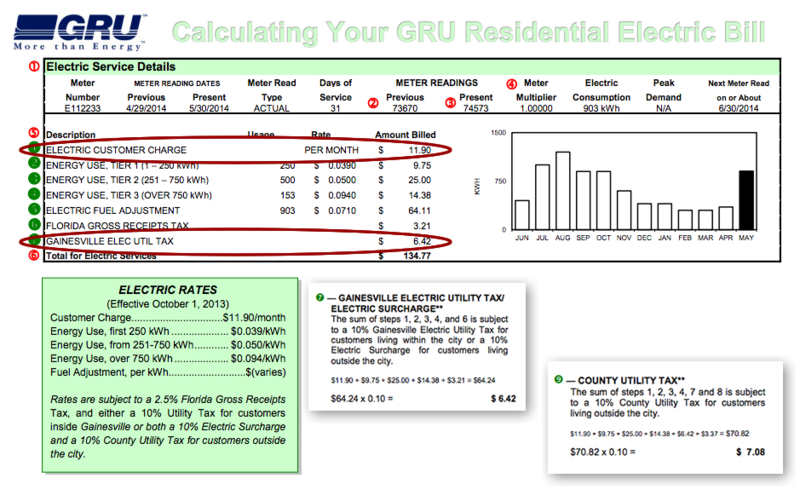 A local advocacy organization representing a Gainesville resident claims that Gainesville Regional Utilities may be inappropriately taxing a portion of utility bills each month. If the claim is upheld, this could mean Gainesville residents may be able to collect millions of dollars in refunds. Seniors vs. Crime, a program of the state attorney general’s office, is representing James Konish, 59, who noticed what he considered an odd charge on his utility bill four months ago. The dispute centers on the 10 percent tax collected on the portion of utility bills called the “Electric Customer Charge” that is a set fee for all GRU customers. Customers in both the city of Gainesville and outside city limits in Alachua County are assessed tax on that charge. 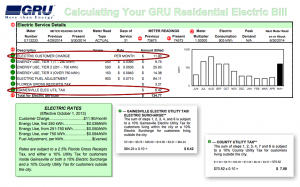 Looking at the fee in aggregate of GRU’s 82,000 residential customers, the fee represents more than $2.7 million the utility may have collected on behalf of the city and county over the last three years. Calls to city and county officials in the last two days were not returned. The state attorney office said they could not comment unless the office was actively working on the case. WUFT News reached out to other utility companies in Florida, including Duke Energy. According to a spokesperson, Duke does collect a customer charge on electric service, but does not assess a municipal tax on that fee. According to Konish, a private attorney in the city, it wasn’t the charge that was the problem, but the taxes applied to it. In the state of Florida, a municipality can tax purchases of electricity, gas and water up to 10 percent. That means you can be taxed on consumable goods purchases from a utility company approved in state law as well as reinforced in city and county ordinances. Konish stipulates, however, that a set fee is not a consumable good. He took his complaint to Seniors vs. Crime, where John Caravella took up the case. “When we look at that as a non-consumable versus the ability to tax consumable electric use, we don’t see a justification for the tax on the Electronic Customer Charge,” said Caravella, who leads the Alachua County office. According to state law, anyone who was inappropriately taxed may request a refund, within a three-year statute of limitations. A 10 percent charge of the ECC for the last three years would equal a potential $33 refund for each GRU customer, according to Caravella. “It may seem like a small amount, but when you look at it in the context of maybe a customer facing a disconnect over $33, it could be significant to the individual, if not the community as a whole,” Caravella said. Seniors vs. Crime was also behind the successful effort to correct nine cases of overcharging customers at Gatorland Toyota last year. An investigation by the state attorney general’s office was settled in March. In the letter, Carvella inquired “whether the ECC qualifies as a ‘purchase of electric power’ or whether the ECC is a fixed nonconsumption charge and thereby not a purchase of electric power subject to the 10% tax,” as allowed by Florida statute 166.231(1)(a). The Seniors vs. Crime office is only looking at the ECC because Caravella says they are certain of how that’s defined by law, but there are also fixed charges for natural gas and water use that are also taxed. Clarification: An earlier version of this story online said that the state attorney office did not return calls for comment. We have updated the story to reflect that they are unable to comment unless they are engaged in an active investigation. I’m concern about gru charges on my decent parents property. No loves in their condo but I must keep the power on. I shut all breaker switches off but the frog and one light and the bill is always between 54 -74 depending on the season. I spoke with gru,they said even with 0 consumption there is an average 40 charges so even so how does the bill go between 54-74 through the year when no consumption has changed. I feel cheated.